The foam inside is made with high-quality, safe, CertiPUR-US certified foam. The cover is quilted for an extra layer of softness, and has a waterproof backing to protect the foam. A Colgate Changing Pad and Changing Pad Cover make a great baby shower gift for any expecting parents! SKIP HOP Baby Pronto Portable Changing Station. Extra-wide wipe-clean changing pad. Drop it in any bag, strap it to your wrist or clip it to your stroller. Contoured walls and quick release safety belt keep baby comfortably and securely on pad. 16" x 32" changing pad fits most standard changing pad tables. Durable quilted vinyl is 100% waterproof material that can be wiped clean with a damp cloth. Superior Quilted Bamboo Changing Pad Liners Reusable Waterproof 3 Pack 26"x12.5"
We also use a thin, waterproof and nontoxic TPU backing. Baby Comfort?. pad liners are much more comfortable than disposable diaper pads. QUALITY AND SAFETY - Bamboo fiber is naturally anti-bacterial, hypoallergenic & raised organically without fertilizers or pesticides - waterproof layer made with non-toxic TPU, No Vinyl/PVC. Soft for the baby since all 4 sides are inflatable. 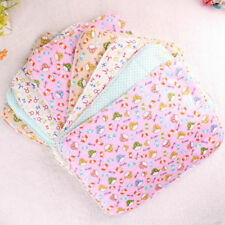 CATH KIDSTON FOLDING BABY CHANGING AND NAPPIES MAT. TheSkip Hop Pronto Changing Station Chevron is the ultimate nappy changing tool and makes baby changing easy-no matter where you are. Simply drop the Pronto in your bag, strap it to your wrist or clip it to your stroller and go! Pipsy Koala Travel Changing Mat Size unfolded 55 x 30cm Folded 20 x 30cm Padded wipe clean babe changing mat Easy to carry wherever you go Ideal for holidays, days out and visiting friends . The Obaby Tiny Tatty Teddy Changing Mat - Pink is provides a perfect comfortable surface for baby during changing. Perfectly sized for use with Obaby changing units. TheObaby Tiny Tatty Teddy Changing Mat - Pink is provides a perfect comfortable surface for baby during changing. The 2-Sided Contoured Changing Pad was designed with your baby's safety in mind. With contoured walls and quick release safety belt, this changing pad ensures your baby is secure. The soft, foam pad is comfortable for baby, and durable quilted double layer vinyl is easy for parents to clean. The Obaby Changing Mat - Unicorn is a simple but effective changing mat provides a perfect comfortable surface for baby during changing. TheObaby Changing Mat - Unicorn is a simple but effective changing mat provides a perfect comfortable surface for baby during changing. Keep your baby safe, clean and freshly changed with the Skip Hop® Pronto Feather Signature Changing Station. This portable changing pad will keep your baby safe, clean and happy whenever and wherever they need to be changed. Prevent the urine from flowing on the bed or baby body. Waterproof and breathable, baby red PP farewell. Material: cotton waterproof material. 1 x changing pad (pad only, other accessories are not included). The Obaby Changing Mat - Little Prince is a simple but effective changing mat provides a perfect comfortable surface for baby during changing. TheObaby Changing Mat - Little Prince is a simple but effective changing mat provides a perfect comfortable surface for baby during changing. TheMunchkin's Go Pad Nappy Changer lets you take just the essentials in a slim, cute clutch. Munchkin have a comprehensive range of travel safety solutions, combining safety and convenience, whilst on the go. Clutch Extra Cushioned Extra Long Foldable Travel Station Pad For Babies and Toddlers. Length：28.5 Pad area - 37" with bag attached. Waterproof with Padded Pillow. To all of you who follow through & I hope you enjoy your item! UNIQUE DESIGN: One-hand transformation from clutch to diaper changing station. Portable baby diaper changing pad ensures that baby is always clean, dry and happy. Drop it in any bag, strap it to your wrist or clip it to your stroller and you're good to go.